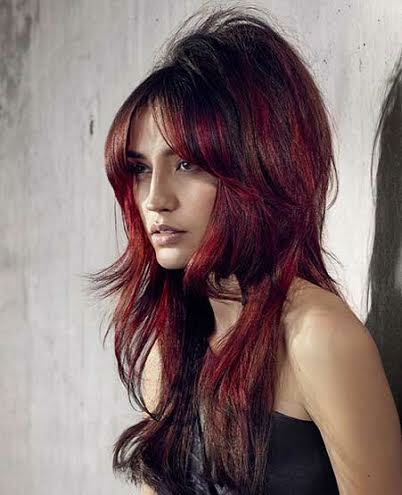 Brunettes provide a striking effect with multi dimensional colors highlighted and lowlighted throughout the base color. This year we are focusing on keeping the natural base hair color and adding lowlights for even a richer hue to make the hair appear shinier with violet undertones. With the variety of hair color options available to us in our industry, we can take your natural brown color and make it warm or cool just with some pigments that keep the hair healthy every time we use it. Be part of the IT crowd and try one of these newest hair colors today. Espresso Coffee adds a neutral golden shades to give incredible shine to all brunettes. Spiced Coffee creates more depth in the color providing even more richness to the color. Cafe Noir keeps the reds at bay by neutralizing those warm tones. We recommend this service be maintained every four weeks to keep the vibrancy and clarity of the color. Chocolate luxury infuses warm rich golden red violet shades to your brown haircolor. Brazilian Richness – very dark rich brown base with a hint of coco colour. Richy Rich Brunettes executes confidence and sensuality. This woman is strong and makes a statement when she walks into the room. She can be your power executive or your confident soccer mom in the evening. Do not underestimate this woman! Caramel Brown – light brown with unbelievable caramel highlights around the face. This is a very low maintenance colour for any woman that doesn’t have extra time but wants to get noticed. We recommend the Balayage technique or Somebre’ to create a natural diffusion from the darker roots (scalp) to lighter mid lengths and ends. Nutmeg Warmth – is spicy with warm tones on top of a warm brown. Looks great on paler skin that needs some warmth to it. Classic Neutral – brunette hair coloring for the woman that doesn’t like warmth. She likes what she likes! We use special mixes of browns and tones to neutralise the warmth. Very classy.